A rare opportunity to purchase this spacious three bedroom town house situated on the popular Fairford Leys development which has been much improved by the current owners. Accommodation comprises; entrance hall, cloakroom, utility, refitted kitchen/diner, lounge, three bedrooms with en-suite to master, family bathroom, garage and driveway parking. 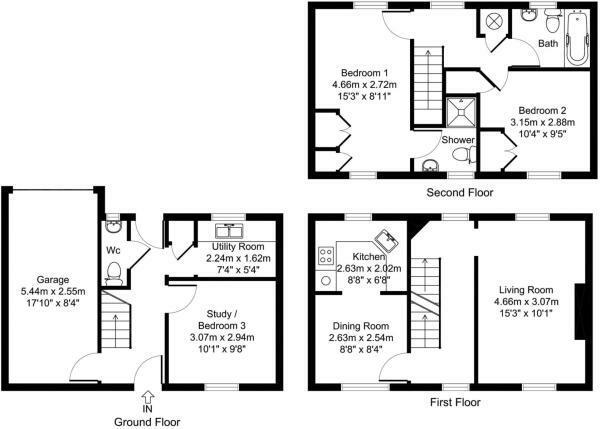 Radiator, stairs to first floor, doors to garden, storage cupboard, utility room, cloakroom, and study/bedroom three. Range of base and eye level units, single drainer sink unit, space for washing machine and tumble dryer, radiator. Double glazed window to rear aspect. Low level w.c. radiator, pedestal wash hand basin. Double glazed windows to front and rear aspects. Two radiators. Stairs to second floor. Double glazed windows to front and rear aspects. Two radiators. Double glazed windows to front and rear aspects. Range of base and eye level units with granite work surface over, four ring gas hob with hood over, double oven, integrated fridge/freezer and dishwasher, single bowl sink unit, tiled splash backs, radiator. Doors to bedrooms one, two and bathroom. Double glazed windows to front and rear aspects. Fitted wardrobe, two radiators, door to en-suite. Double glazed window to front aspect. Pedestal wash hand basin, low level w.c. shower cubicle, tiled splash backs. Double glazed window to rear aspect. Radiator, pedestal wash hand basin, low level w.c. panelled bath with shower over, tiled splash back. Single garage, driveway to rear in garden plus additional parking space. Double gates to rear, driveway, patio seating area, mainly laid to lawn with raised borders.